I’m pretty sure my 1985 self would think my current self is pretty cool right about now. I had a chance over the weekend to take photos of singer and actress Molly Ringwald, the star of “The Breakfast Club” and other John Hughes flicks. She was in town with her quintet to play at the Sacramento Jazz Festival and Jubilee. She was clearly at home before a big crowd in the Hyatt ballroom, referring back to her previous appearance many years ago at the festival with her dad’s Fulton Street Jazz Band. But the most important thing she did was thank folks for coming out. She said jazz is “cool,” and she’s right. This was my eighth year volunteering as a photographer for the event, and I look forward to it each time. I was there for parts of all four days, soaking up the music. On Saturday, L., A. and little C. joined me for a couple hours. We sat for awhile on the grass under a tent at the Family Stage in Old Sac, listening to old-timey but somehow fresh tunes played by Loose Marbles, an outfit out of New Orleans. The kids were more interested in the ice cream cones we bought nearby, but C. was bobbing and swaying to the music, grooving like only a 2-year-old can. I’m just hoping the kids grow to love this real-time music history lesson just as much as I do. And there was a lot to like this year: the Buena Vista Social Club-like Afro-Cuban songs played by Sacramento’s La Descarga!, the New Orleans blast of Louis Ford and the sublime Latin sound of Ray Obiedo. This year’s fest seemed to have something special going. Maybe it was the long-awaited warm weather. But the crowds really seemed into it. 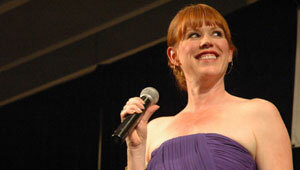 Ringwald said she was glad to see the festival is still happening after all these years. She had the crowd from the moment she walked on stage, and her return showed a lot of class. Let’s hope she and other jazz fans keep coming back. The festival one of those things we need to support, or else we risk seeing it fade away.